The time between each frame is 0.1 seconds. Jessica Hardy's time for the event was 1:06.20, a new world record. Frame #1: The kick is near completion. Turbulence indicating drag forces follows each foot and lower leg. This kick and body position is typical of the latest evolution in breaststroke swimming. When the kick is maximally propulsive, the arms and body are fully streamlined so that the powerful kick-forces propel a minimally resistive body and arms. The position of the feet is also indicative of stroke evolution. The kick is directly backward, not a sweep out or in or some other indirect action that was used popularly in the past to describe the path of the feet in the kick. A direct backward kick results in maximal forward thrust requiring the feet to finish well apart. Frame #2: The kick is completed with the feet well apart. The arms begin to spread. This indicates a timing feature. As soon as leg propulsion ends, the arms begin to be repositioned to enable the production of arm propulsion. There is no glide with no action occurring. The whole swimmer is in streamline. Frame #3: The arms spread as the feet close together. There is a hint that the hands are pitched to produce some outward sculling force. The swimmer's neck begins to hyperextend rotating the head forward causing the face to produce some resistance (indicated by the milky water coming off the chin). Any outward sculling forces would be used to support the shoulders and head movements. Frame #4: The hands have reached their maximum spread. The feet are almost together. Streamline is maintained. The head has continued to rotate forward and the amount of turbulence coming off the face has increased when compared to that of the previous frame. Frame #5: Arm propulsion begins. The upper arms medially rotate as the elbows bend. The hands face directly backward. Some abduction of the upper arms has begun. This position is indistinguishable from the initial pulling action of a good butterfly stroke swimmer. Excellent streamline is maintained and the feet are together. Frame #6: The arm action is similar to that of a butterfly swimmer. Large drag forces are developed for the whole arms and hands. Very powerful abduction of both upper arms with the propulsive surfaces of the three arm segments (hand, lower arm, upper arm) aligned to produce a great amount of forward propulsion. However, the lower arms and hands are not vertical. They are pitched slightly to produce a vertical force component that supports the raising of the head and shoulders out of the water. The head-shoulders action is localized by hyperextension in the thoracic spinal area allowing the rest of the body and legs to remain streamlined. Frame #7: The end of the arm pull is exhibited. The great power of this type of pulling action is exhibited in the size of the full-arm turbulence. The upper arms have completely abducted and even entered into adduction. The pitched forearms are maintained to support the elevated shoulders and head. The knees begin to flex indicating another timing feature of preparation for kicking beginning at the time maximum arm propulsion concludes. Frame #8: The hands are brought together and up to the water surface. There absolutely is no inward sculling action, a feature of breaststroke still advocated only a few years ago. The knees continue to bend but do not match the rapidity of the arm movement. While the knees bend there is no action at the hips, which would increase frontal resistance if the thighs dropped lower than the hips. Frame #9: The hands and arms have recovered over the water for a brief time and are positioned to re-enter. The knees continue to bend and the ankles begin dorsi flexion. There still is very little change in hip angle, which maintains good streamlining. Frame #10: The hands have re-entered and spear forward, not downward. The head and shoulders begin to return into the water. Knee flexion and ankle dorsi flexion continue while the angle at the hips begins to increase. Frame #11: The body, head, and arms are streamlined and almost flat in the water. The kick has just begun with the ankles everted in concert with a very brief time when hip angle is sufficient to produce a momentary increase in frontal resistance. The width of the knees is notable and comfortable for the swimmer. The ankle positions allow the greatest surface area of the legs to be used in the kick including: the insides of the feet, ankles, and lower legs. The turbulence following those leg parts indicates the effectiveness of this position. Frame #12: A position similar to that displayed in Frame #1 is exhibited. Once again, a very propulsive kick is used to move a maximally streamlined body head and arms forward. 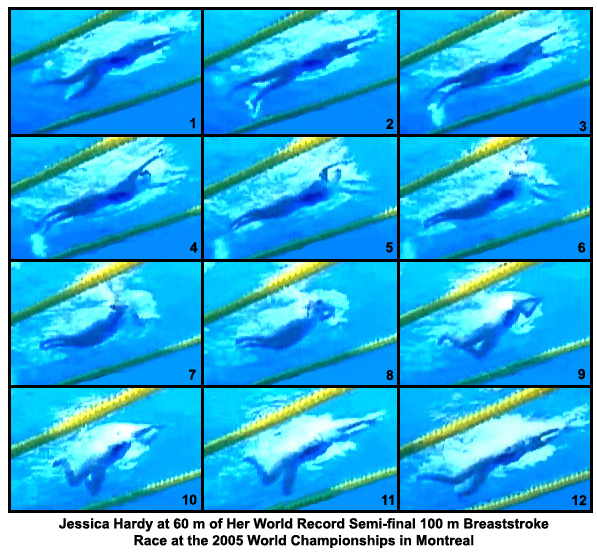 Jessica Hardy's stroke exhibits the features of modern breaststroke that appear to be advances in technique. Her arms display a very powerful backward total-arm thrust, with an absence of any deliberate outward and inward sculling motion although some outward movement was necessary to position the arms for a strong "butterfly-type" arm action. Her body and arm movements are timed to be flat and streamlined when the direct and wide kick can propel the swimmer with minimal resistance. The absence of a glide allows forces to be exerted with shorter inertial lags between strokes and stroke phases. That also facilitates higher stroke rates. Finally, from an overall perspective, Jessica Hardy's force applications are backward in both the kick and arm action. There is little to no evidence of any lateral force development which did occur with "sculling" arm actions and curved kicking paths, which were aspects of breaststroke coached not very long ago.